I need the drawings of airfoils to be used in AeroPack. 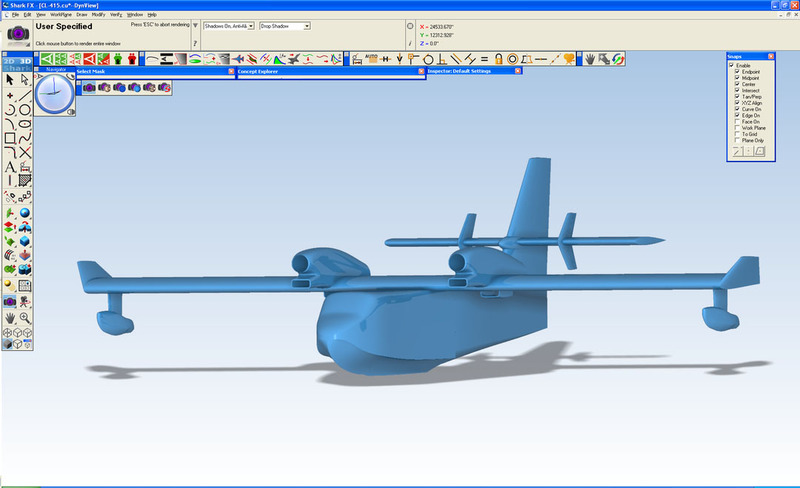 The AeroPack software installation includes a database of over 1,100 airfoil shapes from the University of Illinois at Urbana Champaign (UUIC). To install the database: choose the ‘Custom’ installation option and select the ‘Airfoil Database’ option. You can also download the airfoil example files. When I try to run AeroPack I receive “0203 Error in saving message”. I do not get this message when I am logged in as Administrator. AeroPack uses a program called SoftSentry. This program needs to be able to write to HKEY_CLASSES_ROOT in the registry and the winnt\system32\ folder. I frequently need to reformat my computer and reinstall Windows and I do not want to request a new key for AeroPack each time. The AeroPack key will not change if you need to reformat the hard disk. Just input the key again after reinstalling the software. How does AAA relate to AeroPack? 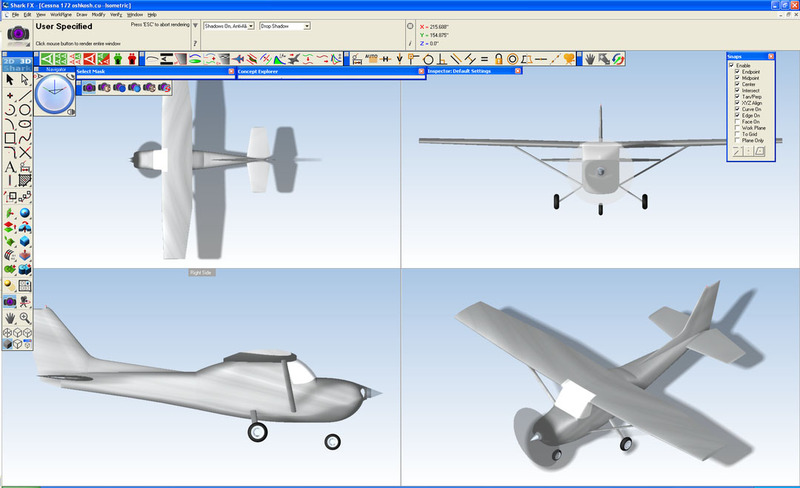 AAA interfaces with AeroPack, which is an add on software to SharkCAD Pro. The interface is actually file exchange. AAA exports a geometry file and AeroPack can import this file. There is currently no export from AeroPack into AAA. This is planned for a future version.  Can I export my airplane drawing from AeroPack to AAA? Currently the interface between AAA and AeroPack is only from AAA to AeroPack. Does AeroPack read Auto-CAD files? 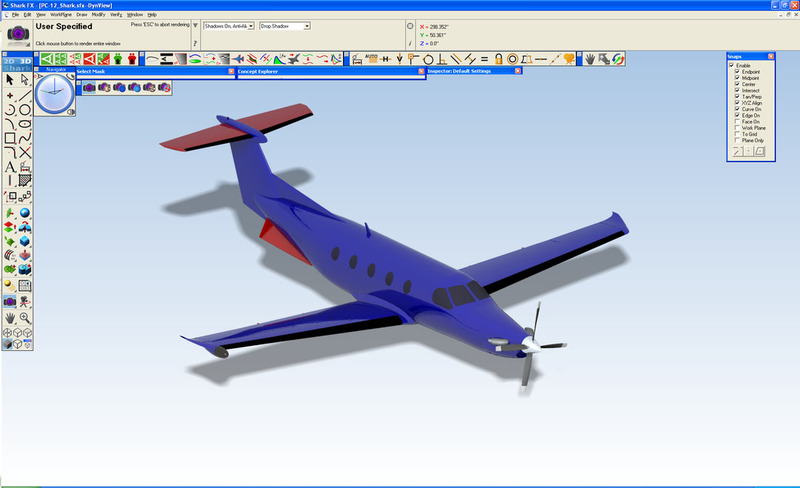 AeroPack reads ASCII, DWG, DXF, ACIS and FACET files and also uses IGES for file exchange. Yes. It is an export option. 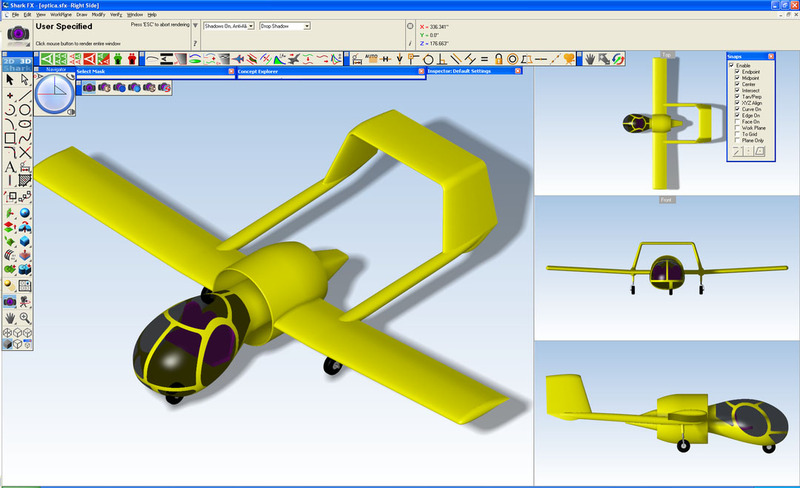 AeroPack is a collection of unique drawing tools created specifically for airplane design and drafting that can also read geometric information from the Advanced Aircraft Analysis (AAA) analysis modules. 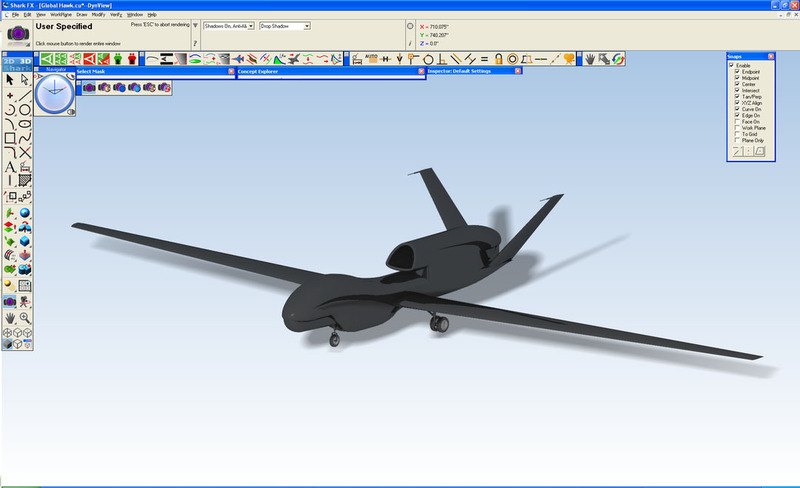 AeroPack is not an independent software, but is an add on to Punch Software Shark FX, providing increased capabilities for today’s aircraft design. What is the benefit of using conics? Should I redraw my airplane using conics? The use of conics actually dates back to before high-powered CAD programs. It was actually first used on the P-51 Mustang as a way to accurately control cross sectional areas to secure the required effect for lift, drag, stability, and overall performance. They provide a good way of mathematically defining cross sections that are more complex than simple circles or ovals. 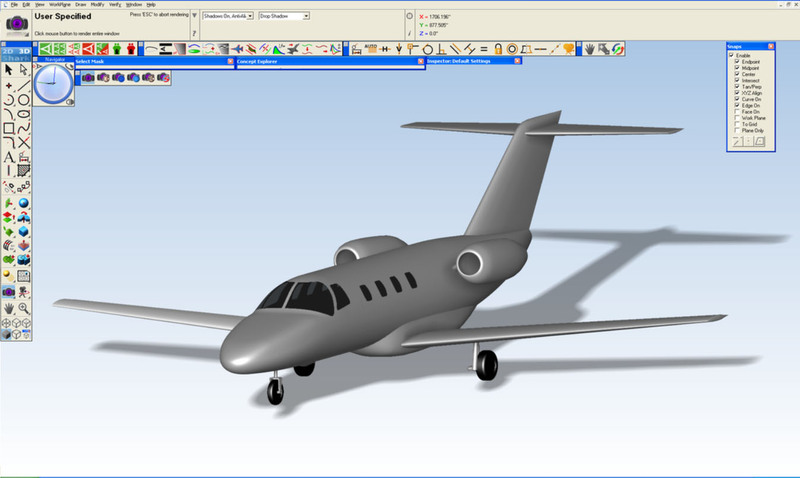 In terms of drawing an aircraft, the main benefit of conics and polyconic surfaces are the ease of creating and updating the model. Rather than having to create each individual cross section, all you have to do is create the profile lines and then you can numerically define the cross sections. Also, you don’t have to worry about unwanted waves developing between your cross sections like you do with Skin surfaces and it is much easier to get proper tangency with adjacent surfaces. For example, when a “Skin Surface” type method is used a “crease” will often appear down the center of the aircraft where the surfaces were not tangent. This almost always happens and is difficult to get out while keeping a symmetric aircraft. By using polyconic surfaces, symmetry and tangency are guaranteed. Since you already have the model created, there is probably no reason to redraw it until you decide to make changes. In the isometric view the airplane is oriented along the X axis. Does this correspond to the Y axis in the conventional coordinate system or is the aerospace practice to orient along the X axis instead of the Y axis? The Aerospace convention is to orient the fuselage along the X-axis, not the Y-axis. We just have to be different from the rest of the world. There is an option to change the view definitions in Shark FX by going to File > Preferences > General : View Definitions. Where do I find the Part Library? Can I add to the library? To find the Part Library, go to SharkCAD Pro main menu > Window > Concept Explorer > Symbols (tab). You can also expand the library with your own entry by adding subfolders to C:\Program Files\Punch! Software\SharkCAD Pro 10*\Symbols. How do I know if AeroPack has been installed? In SharkCAD Pro startup splash screen, you will see “AEROPACKED” in the lower right-hand corner if you have installed AeroPack. Or you can go to Shark/ SharkCAD Pro main menu > Help > About… and bring up the splash screen. Where do I find AeroPack in SharkCAD Pro? After you have successfully installed AeroPack, on SharkCAD Pro main menu, go to Window > AeroPack. A new set of AeroPack tools should appear.